No time to head to the forest or the beach? 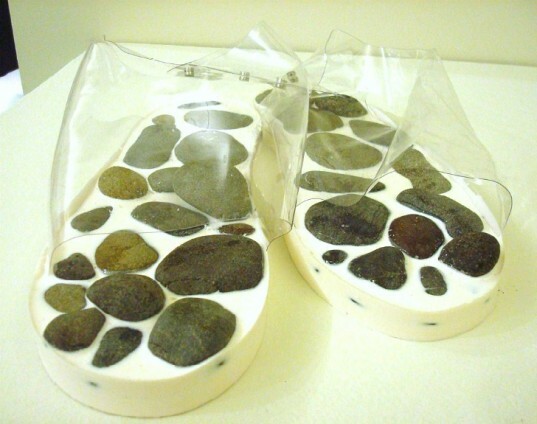 Bring nature to you by stepping into a pair of insoles made with living moss or river rocks. Created by Kristin Neidlinger, Natura is a line of shoe inserts designed to augment balance and reconnect the body with nature. The “Pathos” range uses all-natural elements, gathered locally near Mendocino Headlands State Park, that Neidlinger plants into a 100 percent latex footbed. Combined with a wireless audio device that plays the sounds of nature, the shoes transport you to a more tranquil path. Who needs Calgon? By putting nature in direct contact with your soles, which are equipped with fine-tuned nerve receptors, Pathos provides an immediate sensory experience akin to walking barefoot. It’s hard for city dwellers to connect with anything other than concrete and the occasional patch of grass, so the insoles act as nature therapy. A wireless mic enhances the experience by piping the sound of your footfalls to your headphones, further reinforcing your connection with the natural world. For city dwellers who are unable to connect with anything but concrete, the insoles act as nature therapy. 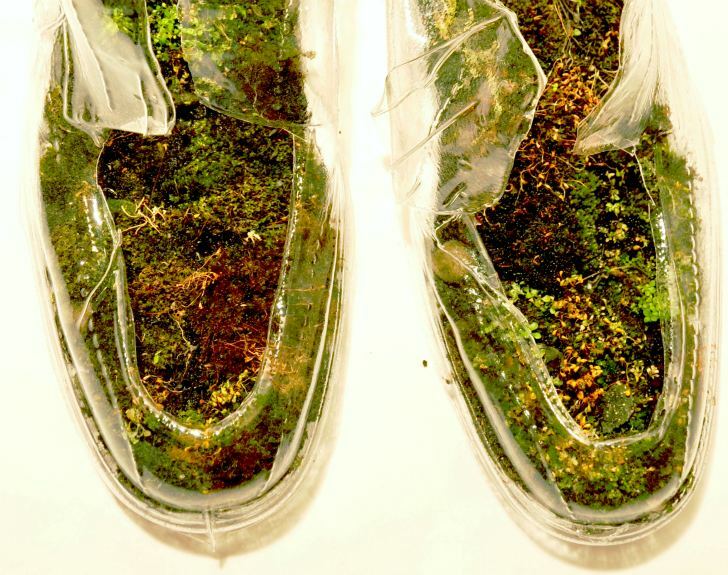 If you’d rather not have a terrarium in your shoe, Neidlinger also designed the Natura Virtual, a haptic insole that vibrates to mimic the feeling of walking on moss, sand, or rocks. Its uneven surface also forces you to work on your balance and posture as you walk, helping to restore not only your sense of equilibrium but also retrain any vestibular disorders. Made in San Francisco, the Natura Pathos and Virtual are both in concept stages. Moss in your shoes...that's a little weird (even for me), but I guess that's why there is the other option of the haptic insoles that vibrate. On the other hand, isn't this "connection with nature" really a DISconnection? I mean, just to hear the sound of nature, you'd have to use headphones...doesn't that automatically make it unnatural? Wouldn't it be better to just save the real thing? That way these inventions wouldn't be necessary...But I guess they're good if you're in the city. They might cost a pretty penny, though. Thoughts? No time to head to the forest or the beach? Bring nature to you by stepping into a pair of insoles made with living moss or river rocks. Created by Kristin Neidlinger, Natura is a line of shoe inserts designed to augment balance and reconnect the body with nature. The "Pathos" range uses all-natural elements, gathered locally near Mendocino Headlands State Park, that Neidlinger plants into a 100 percent latex footbed. Combined with a wireless audio device that plays the sounds of nature, the shoes transport you to a more tranquil path. Who needs Calgon?